Time for dessert! This delicious dairy-free dessert is decadent and just perfect treat to satisfy your chocolate craving. It’s great for Valentine’s Day because it’s fast. You can prepare and serve this dessert in less than 30 minutes. You can also prepare it ahead of time and chill in the refrigerator. The Healthy On You Lavender Fields Forever sea salt makes a huge difference in this recipe so don’t forget to sprinkle it on at the end. 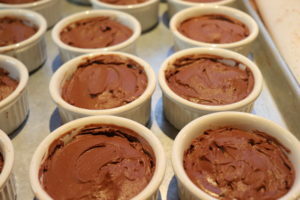 Break the chocolate into small chunks and put them in a bowl set over (but not in) a small pot of barely simmering water. Stir gently until the chocolate is melted and smooth. Remove the bowl from the steam bath. Toss the tofu into your food processor. Add the sugar, vanilla, salt, Grand Marnier and the chocolate, scraping the bowl to get all the mixture out. Purée until smooth and delicious. Spoon into individual serving dishes and chill while you make the coconut whipped cream. Open the can of coconut milk, taking care not to shake it. Scoop coconut cream solids into a cold mixing bowl. Reserve remaining liquid for another use. Beat the coconut cream using an electric mixer with chilled beaters on medium speed; turn to high speed. Beat until stiff peaks form, 7 to 8 minutes. Add sugar and vanilla extract to coconut cream; beat one minute more. Taste and add more sugar if desired. Add sugar and vanilla extract to coconut cream; beat one minute more. Taste and add more sugar if desired. 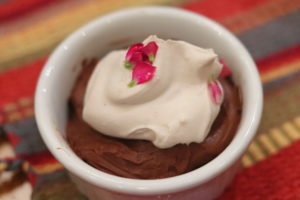 Remove the Chocolate Mousse from the fridge and top with the whipped cream. Serve immediately. 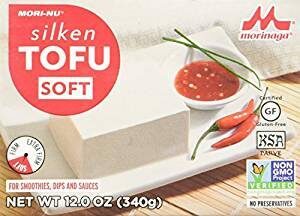 *NOTE: Silken tofu is not typically found in the refrigerated section of the markets. If you can't locate it, ask.